Our criminal justice system is broken. The United States has the highest incarceration rate in the world. As many as two-thirds of those released from prison are rearrested within three years. And African-Americans and Latinos are far more likely to be imprisoned than whites. Problems of this scope will require a seismic change. What do we as Christians have to offer to the debate on criminal justice reform? Mennonites have been leaders in promoting restorative justice models in communities across the country. Restorative justice seeks to address the needs of victim and offender. Its concepts resonate with the biblical vision of shalom, restoring broken relationships within communities. 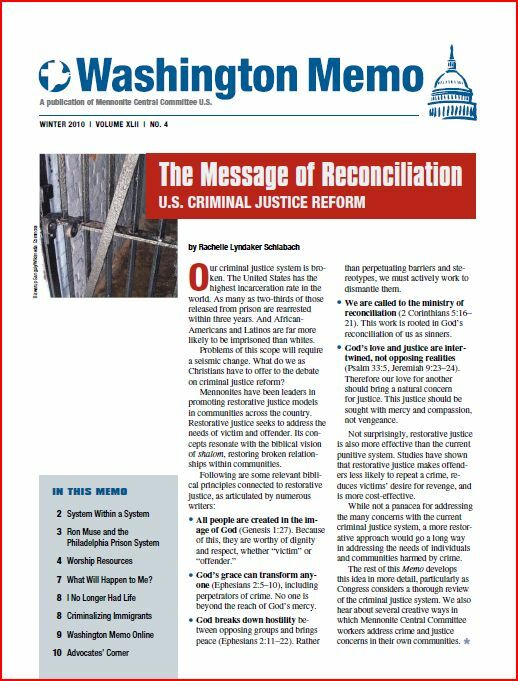 While not a panacea for addressing the many concerns with the current criminal justice system, a more restorative approach would go a long way in addressing the needs of individuals and communities harmed by crime.